A varied trek, landscape, vegetation, and culture all change constantly. There are numerous fascinating villages. The chief difficulty is that after several steady days in the Marsyangdi valley you reach Manang at 3400 metres, and a couple of days later you are 2000 metres higher on the Thorung La. Be aware of the potential for altitude-related problems. Things change ! Road-building is going on apace both up the Marsyangdi Valley – it’s now possible to travel by jeep to Chame (and ultimately, at some future date, to Manang) See end of article. 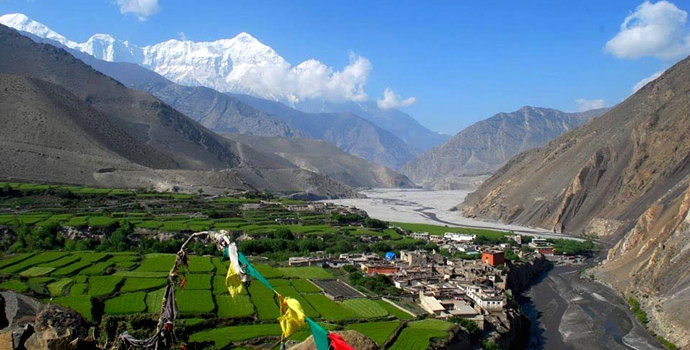 In the Kali Gandaki valley it’s now possible to reach Muktinath by jeep via Pokhara – Beni – Jomsom. Buses run from Pokhara to Jomsom (and back !). It’s debatable how this road building will affect trekking. It makes it feasible to do the shorter Circuit, for example Besisahar to Jomsom, in far fewer days, but presumably trekking and traffic are not such a pleasant mixture. A relatively new option is to rent a mountainbike in Muktinath or Jomsom and ride your way down, turning road construction in a positive thing for tourism. Mustang is on it’s way to becoming a major downhill biking destination. There are numerous lodges along the route, some of them very good. A highly experienced, helpful, knowledgeable, friendly , Well trained English speaking, Government License holder guide ( Nepal Planet Treks ) with all his salary, food, drinks, accommodation, transportation and insurance. One night’s hotel in Pokhara. In a worst case scenario, arrangement of Emergency Helicopter service (actual evacuation on helicopter to be paid by your Travel insurance). Trekking map of the Annapurna Circuit region. Hotel and meals in Kathmandu. All the alcoholic and non-alcoholic hot and cold drinks.